The latest issue of Official PlayStation Magazine leads on Control and Days Gone. With only weeks until the long-awaited release of Days Gone, we sit down with the team at Sony Bend and play through the open-world adventure, Freaker fights and all. In the new issue of Official PlayStation Magazine, arriving with subscribers now and on sale April 9, we find out whether, after so many delays, the game can sit alongside other Sony releases like Horizon Zero Dawn. • Save up to 50% when you subscribe to Official PlayStation Magazine. Given the delays, Days Gone is that rarity for Sony: a first-party game that may struggle. Without the legacy of God Of War or the cachet of Spider-Man, Days Gone needs to ride its own path. Our massive 10-page feature goes deep into the world, the friends and enemies you'll meet, and deeper mechanics of a game that will surprise many. 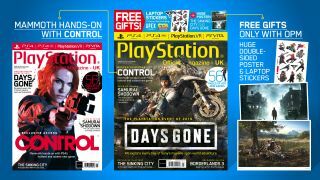 Official PlayStation Magazine #161 visited Remedy to go hands-on with Control. We embrace the new weird of Control this issue too, and the game makes our cover! This is Remedy's first PlayStation game since 2003 and our exclusive hands-on with the game suggests the developer is going to win over PS4 players this summer when Control releases. We tour Remedy’s studio, meet the team, and spend a day playing Control, PS4’s strangest and most unique new shooter. The game is a world within a world and takes you to places you never thought a shooter go, with surprises around every corner. “You might think initially that this is just one place, but it’s vastly more complex than that, it infinitely goes into all directions. If you take for instance, Doctor Who’s TARDIS, it’s like the same idea – it’s bigger on the inside,” describes Creative director Mikael Kasurinen in our feature. Did you bring your wellie boots? Official PlayStation Magazine goes hands-on with The Sinking City. The third exclusive in OPM #161 is a play through The Sinking City, the new horror title from Frogwares. This impressive Cthulhu-inspired detective adventure picks from the famous author's work, and reworks it into an open-world shocker. There’s an air of Silent Hill to this adventure, you can discover what we learned this issue as play through two entire cases of the detective's workload and meet some unsavoury cultists in a cave below the waves. • Try an issue for FREE when you subscribe on iOS devices and Google. There's more in Official PlayStation Magazine #161 too. With one eye on the East we chat to some of the devs working with Sony on the China Hero Project, and get the scoop on a retro mecha-rabbit shooter, a battle royale survival MMO set in the 17th century, and a pixel-art cyberpunk brawler that shouldn’t be missed. All of this and every reader gets a FREE Days Gone and The Sinking City poster, plus a laptop sticker sheeter featuring Crash Bandicoot and Apex Legends. Official PlayStation Magazine #161 goes on sale Tuesday, April 9 in both print and digital forms. Print subscribers, however, are reading their new issues right now. To join them, check out the latest Official PlayStation Magazine subscription offers.